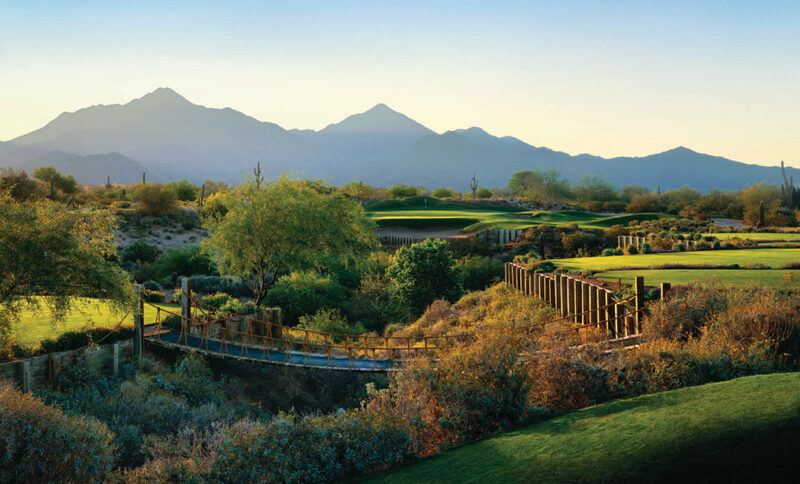 Since opening in 1994 in Scottsdale, Grayhawk Golf Club has become one of Arizona’s most celebrated daily-fee golf clubs, mostly because of Grayhawk’s two exceptional 18-hole golf courses – Talon and Raptor. Both courses have earned numerous awards and accolades over the years and have hosted high-profile competitive events such as the Frys.com Open, a PGA Tour event held at Grayhawk from 2007 to 2009. Other tour-sanctioned events include the Andersen Consulting World Match Play Championship (now known as the Accenture Match Play Championship), Tommy Bahama Challenge, the Williams World Challenge (now known as the Chevron World Challenge), Waste Management Phoenix Open Pro-Ams, Tommy Bahama Desert Marlin, PGA Junior League Golf National Championship and the Thunderbird International Junior. Grayhawk Golf Club is honored to become the new host site for the Division I NCAA Men’s and Women’s Golf Championships for 2020 to 2022. Grayhawk is not only familiar among some of the world’s best competitive golfers, it’s also a favorite of the game’s many weekend warriors who appreciate the quality and challenge of Talon and Raptor just as much as their professional counterparts. In fact, it’s strictly a daily-fee golf club available to anyone wishing to test their mettle against these two tour-tested courses. Grayhawk’s Golf Shop and Trading Company has been named as one of “America’s Best 100 Golf shops” according to the Association of Golf Merchandisers. Stop by for a unique shopping experience. No matter what a golfer’s goals may be or what part of your game needs improvement – the instruction team at Grayhawk Learning Center has it covered. Learn to play better and enjoy the game more. Whether you want a morning jolt of espresso, just coffee or tea, healthy smoothie, pastry or muffin; need to quit those hunger pains with a salad or sandwich; desire a unique dining experience or lost a bet and need to buy a round of drinks, Grayhawk offers you dining options to suit your hanker. Check out the Morning Joint, Phil’s Grill, Quill Creek Café and Isabella’s Kitchen. The clubhouse was built to entertain your family, friends and co-workers during any number of special events. The spectacular facilities such as the clubhouse, grand event hall, quaint board room and fairway house set the stage for corporate meetings, banquets, birthday or anniversary parties, rehearsal dinners, receptions or that very special wedding.